Bakersfield Police Department Chief Lyle Martin, center, addresses the media during the briefing about Operation Blind Mice Tuesday morning. 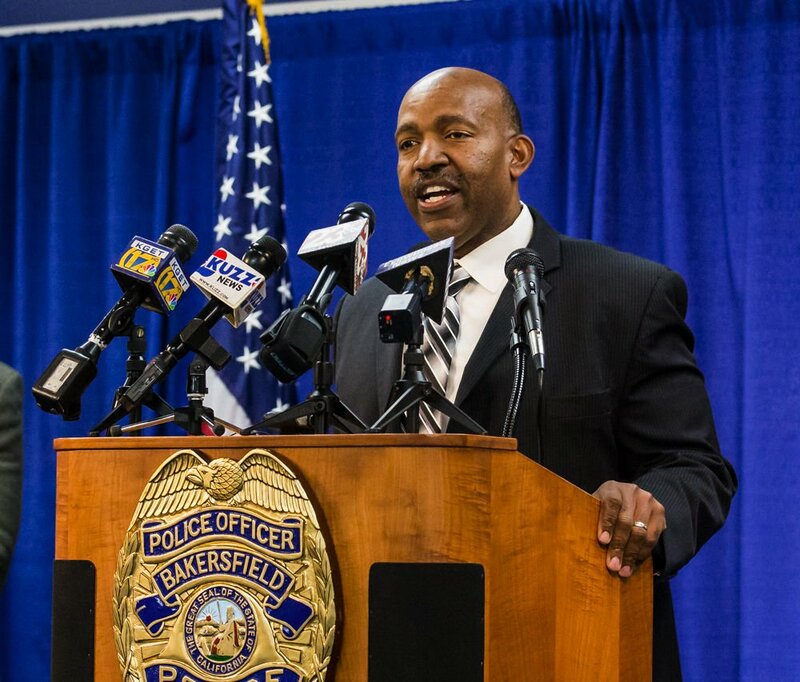 Bakersfield Police Department Chief Lyle Martin answers questions about Operation Blind Mice during a press conference on Tuesday morning. U.S. Attorney Phil Talbert discusses recent events of Operation Blind Mice Tuesday morning at Bakersfield Police Department headquarters. Brent Wood, center, from the Department of Justice, discusses Operation Blind Mice with the media Tuesday morning. At least 40 people associated with the West Side Crips gang were arrested on Tuesday in a multi-agency law enforcement operation that the Bakersfield Police Department said provided leads in at least two especially troubling homicides. BPD Chief Lyle Martin said the investigation leading up to Tuesday's mass bust turned up information on the February homicide of a 5-year-old and the November death of a 3-year-old, two innocents caught up in instances of gang violence. Since March 2017, the department said it has been working with local, state and federal agencies to prepare for a crackdown in Bakersfield on gang members and their associates. That crackdown began at 6 a.m. Tuesday and included more than 30 search warrants. Of particular note, the BPD said detectives were able to obtain four arrest warrants for men believed to be responsible for the murder of Edwin Smith in September: Skylor Billings, Daniel Willis, and Gary Pierson were arrested for murder. Gary Clayton was arrested for accessory to the murder. The operation also resulted in the seizure of 26 firearms, 1,928 grams of methamphetamine and 32 grams of crack cocaine, according to the California Department of Justice. “This is a message that if you want to get out of the gang life, there are avenues for you, but if you continue down that violent path, we will investigate, arrest and prosecute to the best of our ability,” Martin said in a press conference held Tuesday. As of Tuesday, charges had already been filed against 10 people for various drug- and firearm-related crimes, as well as money laundering, Talbert said. Tommie Thomas, 35, distribution of methamphetamine; William Thomas, 35, distribution of crack cocaine; Danny Willis, 33, felon in possession of a firearm; Gary Pierson, 36, felon in possession of a firearm; Ladaireus Jones, 24, felon in possession of a firearm; Bernard Warren, 18, felon in possession of a firearm; Manuel Cruz III, 37, conspiracy to possess with intent to distribute marijuana; Luis Fernandez, 26, distribution of methamphetamine; Myron Dewberry, 44, felon in possession of a firearm; and Bryshanique Allen, 21, money laundering. More than 300 law enforcement personnel from 20 agencies participated in the operation, dubbed “Blind Mice” by the DOJ. Besides the DOJ and the BPD, other agencies involved include the Federal Bureau of Investigation, U.S. Attorney’s Office, California Highway Patrol and the Kern County Sheriff’s Office. The arrests came after a 200-page affidavit was drafted by federal agents that detailed alleged crimes by West Side Crips members, which varied from drug-related crimes all the way to homicide, the DOJ said. During the 10-month investigation, law enforcement used wiretapping, controlled drug purchases and other methods to confirm criminal activity, U.S. Attorney for the Eastern District of California Phil Talbert said. 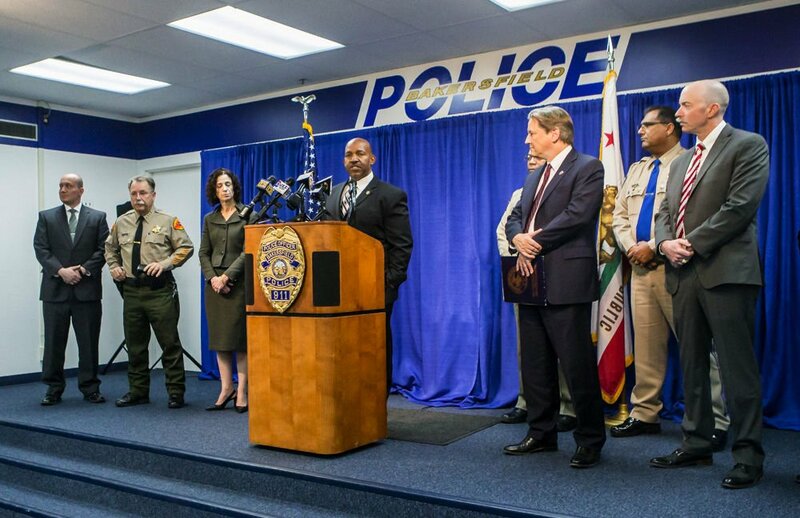 “This operation is another example of how my office has worked closely with our state, local and federal law enforcement partners to combat violent criminal street gangs and their associates,” Talbert said. In the course of the investigation, Martin said, BPD managed to get some new leads in the cases of Kason Guyton and Major Sutton, small children killed in gun violence this year. Guyton, a 5-year-old boy, was killed in February when someone shot at the vehicle in which he was traveling. Sutton, a 3-year-old, was killed in November after someone broke into the apartment he was living in and opened fire on residents. Both children are presumed victims of gang violence. Martin didn’t provide any specifics about the leads at the press conference. No arrests have been made in either case. While Martin said Tuesday’s operation was in the planning stages prior to the deaths of Guyton and Sutton, he said those deaths motivated himself and staff to see it through. Martin said it will take the combined effort of law enforcement, educators, employers and other members of the community to help reduce gang violence by giving those who want to get out more opportunities to do so while continuing to pursue those who don’t. Three men targeted in the operation have not been found yet, BPD said. Tommie Thomas, 35, has a warrant for burglary and participation in a criminal street gang. Jarvis Thomas, 32, has a warrant for sales of a controlled substance, conspiracy and participation in a criminal street gang. Michael Holmes has a warrant for possession of an assault rifle, evading police, burglary and participation in a criminal street gang. Anyone with information on their whereabouts are urged to call the police at 327-7111. Several California Highway Patrol officers were involved in a shooting on Tuesday while attempting to serve an arrest warrant as part of the Operation Blind Mice effort. The CHP said that at around 6:38 a.m., officers were attempting to serve a warrant at a residence in the 600 block of Beverly Drive when someone began shooting at the officers. The CHP said the officers shot back several times but no one was injured. The CHP said the suspect had barricaded himself in the building but law enforcement officers were eventually able to get him out, after which he was arrested. The name of the suspect wasn’t provided by police. The Kern County Sheriff’s Office is investigating the officer-involved shooting aspect of the operation. During the 10-month course of the Operation Blind Mice investigation, the Bakersfield Police Department learned of a plan by members of the West Side Crips to shoot into a crowd of more than 200 people at a local park in early October. Rival gang members were among the targeted group. BPD did not say which park the plan involved. The department said it learned of the plan through wiretapping and officers conducted a traffic stop on three individuals that they thought were involved. The vehicle came to a stop but the occupants got out and tried to run away. Two of them were arrested at that time and one got away — but he was arrested during Tuesday's operation. Three firearms were also recovered during that stop, the BPD said. Arrested? Too bad they weren't executed on the spot. These vermin will get released someday and commit murders all over again.